Alluring, elusive, mysterious—the cats in our lives are not always easy to get to know. But as with all pets, they have unique personalities and stories to tell. Alongside beautiful four-color photos of their cats, A Letter to My Cat collects personal letters from celebrities offering love and gratitude for all that their cats bring to their lives. This follow-up to A Letter to My Dog takes on cats, with celebrities writing letters of love and gratitude to their beloved pet kitties. Celebrity letters of love, whimsy and gratitude to their feline companions are juxtaposed against four-color kitty portraits, in a volume that includes contributions by Dr. Oz, Mariel Hemingway and Jackson Galaxy. About the Author: Lisa Erspamer most recently served as chief creative officer and executive vice president of programming and development for OWN. Prior to that, Lisa was co-executive producer of The Oprah Winfrey Show, where she produced and oversaw hundreds of shows, including the biggest flash mob in history, the legendary car giveaway, Whitney Houston's final interview, and many others. Hardcover biography compilation was released by Crown Publishing on October 28, 2014. 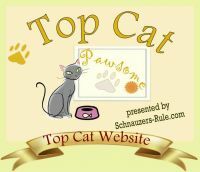 Click here to shop all our Nonfiction Cat Books!